For academics, the term "troubled currency" might be a term of art. But for people who are faced with such a currency, they know a troubled currency when they see one. Today, this is the case for millions of people around the world — most notably in Iran, North Korea, Argentina, Venezuela, Egypt and Syria. A troubled currency is one in which users have lost confidence. When users no longer think a currency will retain its purchasing power, they attempt to dump it for a stable foreign currency (or commodities). As the demand for the troubled currency evaporates, its value vis-á-vis stable foreign currencies collapses, and prices for goods and services sold in the troubled currency soar. As this process develops, expectations about the currency’s ability to retain its purchasing power deteriorate, and a doom loop ensues. At the extreme, doom loops can culminate in hyperinflation — an inflation rate of over 50% per month. This, however, is rare. Indeed, there have only been 56 cases of hyperinflation. The Asian financial crisis of the late 1990s gave rise to several troubled currencies. The Indonesian rupiah was one currency that entered such a doom loop. On August 14, 1997, shortly after the collapse of the Thai baht, Indonesia floated the rupiah — on ill-conceived instructions from the International Monetary Fund (IMF). Contrary to the IMF’s expectations, the rupiah did not float on a sea of tranquility. Its value plunged from 2,700 rupiahs per U.S. dollar at the time of the float to lows of nearly 16,000 rupiahs per U.S. dollar in 1998. Indonesia was caught up in the maelstrom of the Asian crisis. By late January 1998, President Suharto realized that the IMF medicine was not working and sought a second opinion. I was invited to offer that opinion and began to operate as Suharto’s Special Counselor. I proposed replacing Indonesia’s troubled rupiah with a stable rupiah anchored to an orthodox currency board system. On the day that news hit the street, the rupiah appreciated by 28% against the U.S. dollar (see the accompanying chart). 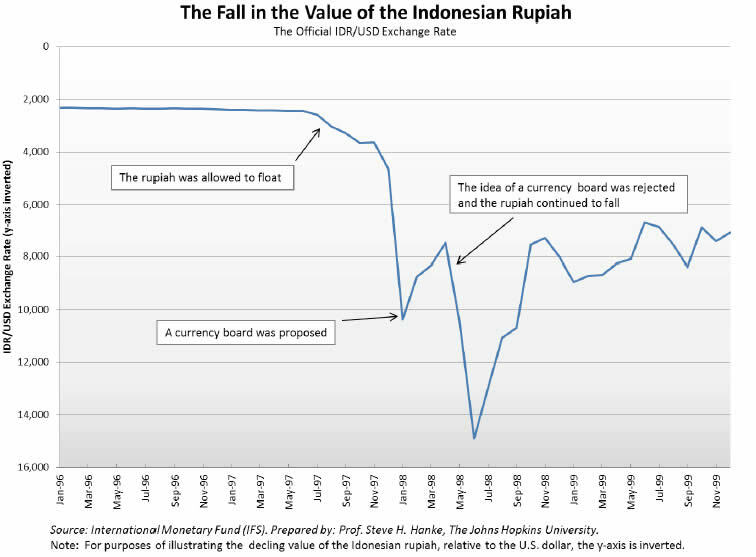 In a sense, the case of Indonesia was unique — the rupiah traded freely on the foreign exchange market, with a floating exchange rate. More often, severe currency problems arise under monetary systems that restrict the convertibility of their currency and/or employ a pegged official exchange rate that overvalues the currency. These circumstances typically give rise to a black market for foreign exchange, where the domestic currency is freely traded at a market determined exchange rate. What’s more, the Suharto government continued to publish economic data after the rupiah became a troubled currency. In many countries with troubled currencies, however, this is not the case. Indeed, regimes in countries undergoing severe inflation have a long history of hiding the true extent of their inflationary woes. Often, governments fabricate inflation statistics to hide their economic problems. In the extreme, countries simply stop reporting inflation data. Yes, official economic data from countries with troubled currencies often amount to nothing more than lying statistics and should be treated as such. How can this problem be overcome? At the heart of the solution is the exchange rate. If free market exchange-rate data (usually black-market data) are available, a reliable estimate of an inflation rate can be determined. The principle of purchasing power parity (PPP), which links changes in exchange rates and changes in prices, allows for reliable inflation estimates during periods of elevated inflation. Indeed, PPP simply states that the exchange rate between two countries is equal to the ratio of their relative price levels. Accordingly, to calculate the inflation rate in countries with troubled currencies, a rather straightforward application of standard, time tested economic theory is all that is required. 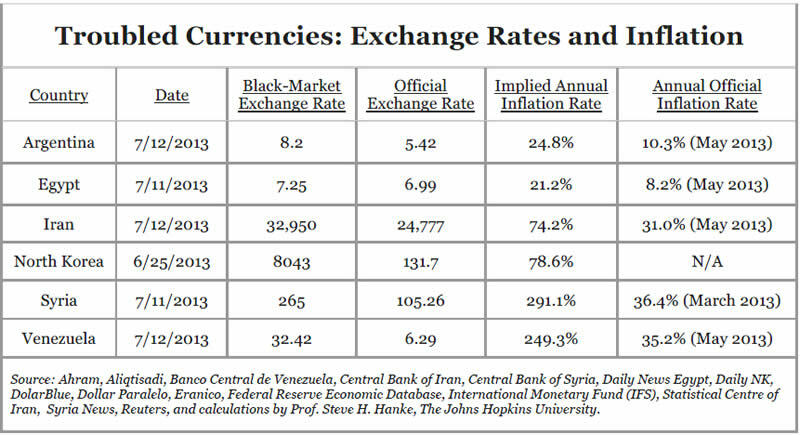 For the past year, I have been collecting black market exchange-rate data from various countries — namely Iran, North Korea, Argentina, Venezuela, Egypt and Syria — and using them to calculate implied inflation rates. While I have published a number of articles and blogs containing information and data on countries with troubled currencies, I have come to realize that there exists no centralized location where black-market exchange-rate and inflation data can be found for such countries. To remedy this, I established the Troubled Currencies Project — a collaboration between the Cato Institute and the Johns Hopkins University. The Troubled Currencies Project hosts a website, regularly updated with the latest black-market exchange-rate and implied inflation rate data on countries with troubled currencies. What follows is a snapshot of the countries that the Troubled Currencies Project currently studies and a more detailed explanation of the circumstances surrounding each troubled currency. The idea for the Troubled Currencies Project arose out of Iran’s inflation crisis in the fall of 2012. The Iranian rial’s exchange rate tells the tale of the effect that Western sanctions have had on Iran’s economy. When U.S. President Barack Obama signed the Comprehensive Iran Sanctions, Accountability, and Divestment Act in July 2010, the official exchange rate for the rial to the U.S. dollar was very close to the black market rate. Since those new sanctions took effect, however, the official and black market rates have increasingly diverged (see the accompanying chart). 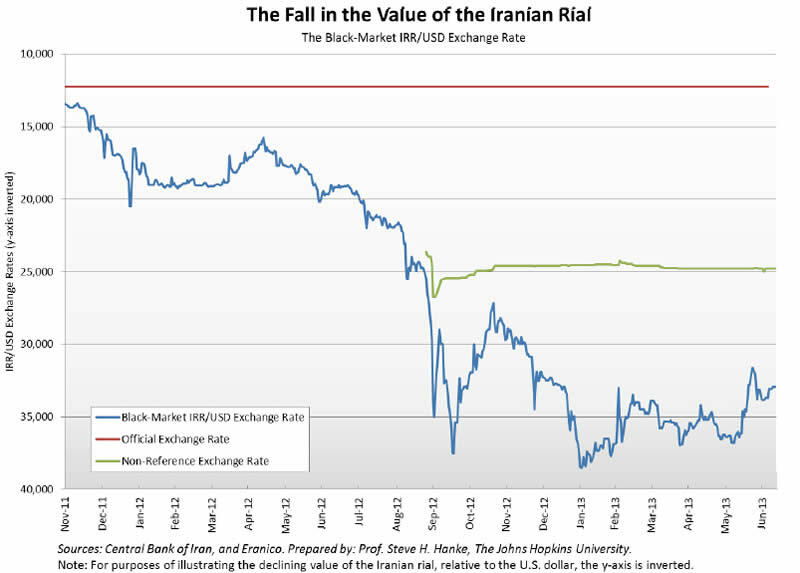 The sanctions began to bite especially hard in early September 2012, and the slide in the value of the rial began to accelerate. The slide was punctuated by two dramatic collapses in the demand for the Iranian currency — the first was in early September 2012, and the second occurred in mid- October 2012, when Iran’s inflation rate reached hyperinflation levels (greater than 50% per month). With each collapse, there was something akin to a ‘bank run’ on the rial — a sharp rise in the black market (read: free market) IRR/USD exchange rate. Since then, the rial has stabilized somewhat, but inflation remains elevated. 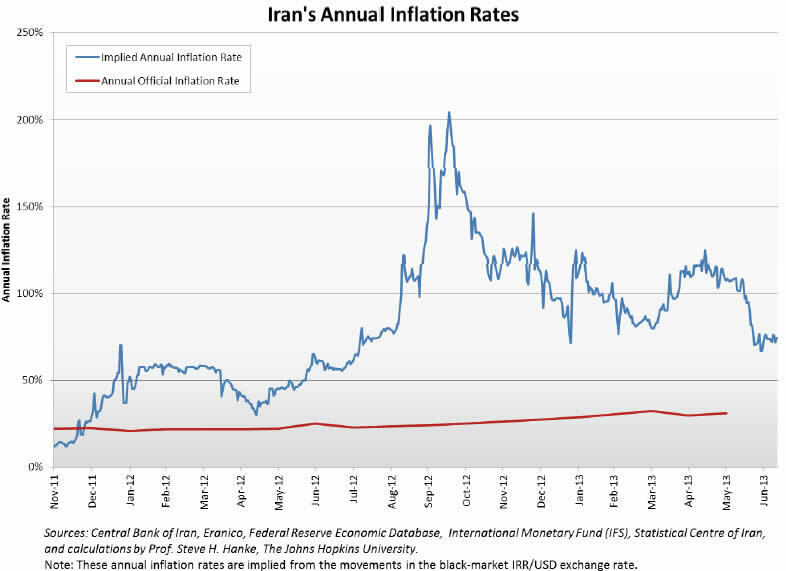 Currently, Iran’s implied annual inflation rate sits at 74.2% (see the accompanying chart). For years, North Korea’s currency, the won, has been officially pegged to the U.S. dollar. That said, exchange controls and a plethora of associated regulations and harsh penalties have rendered the won inconvertible. This, of course, has given rise to a healthy black market for foreign currency. North Korea’s monetary dysfunction has been accompanied by severe inflation problems. In 2009, the North Korean government attempted to address the won’s problems by implementing a phony currency "reform" program, which it promptly bungled. The so-called reform was actually just a currency redenomination program, which arbitrarily lopped two zeros off every won note. North Koreans were given less than two weeks to exchange all of their won for new notes. And, the government set limits on the quantity of old won a family could exchange for new won. For those North Koreans who had saved a few too many won, the redenomination program was effectively a wealth tax program. It should come as little surprise that Pyongyang’s botched currency reform sparked a panic in North Korea’s primitive, underground markets for goods and services. With the currency reform, the demand for foreign currency accelerated, as more and more merchants in the underground markets required transactions to be conducted in hard currency. 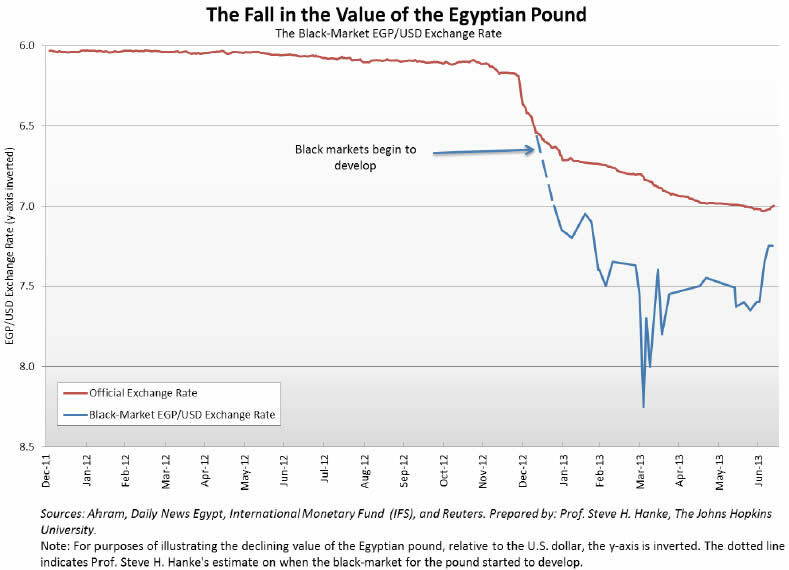 In consequence, the value of the won plummeted on the black market (see the accompanying chart). 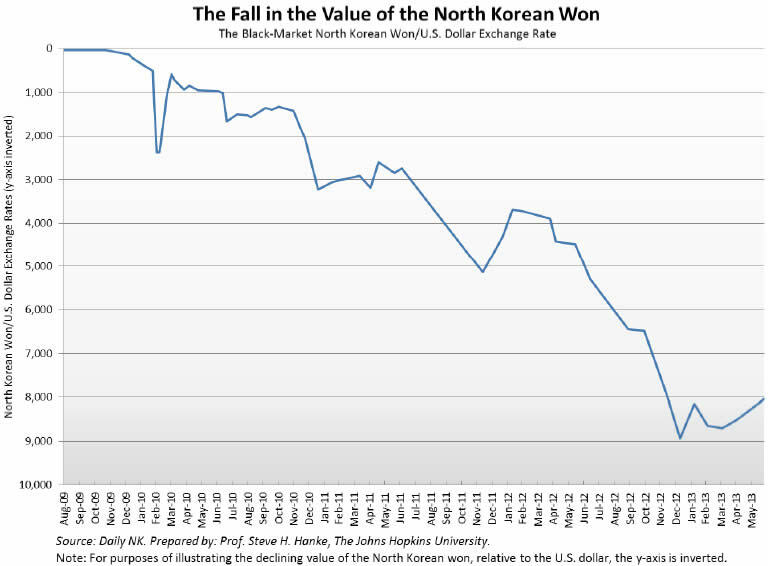 So, what happened to the overall price level in North Korea in the wake of the currency reform? 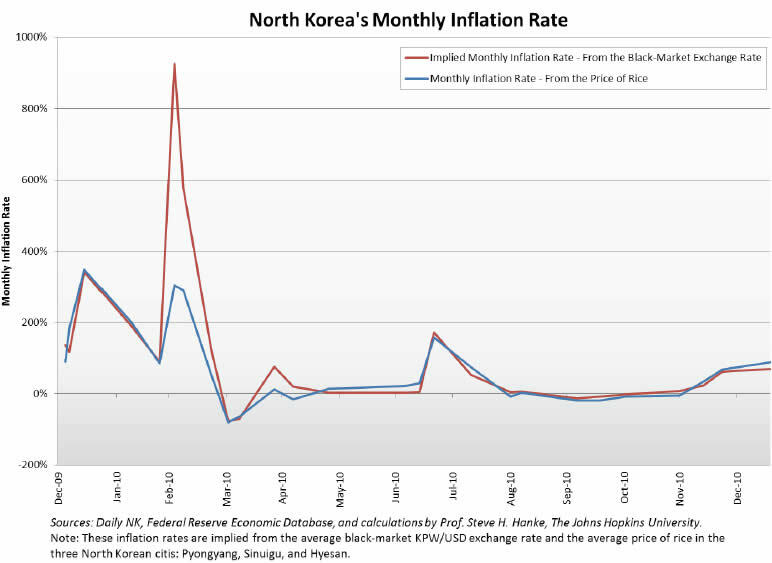 Well, black-market exchange rate data allow us to reach a reliable estimate of North Korea’s inflation rate. As the accompanying chart shows, the 2009 panic sparked an inflation surge in North Korea. 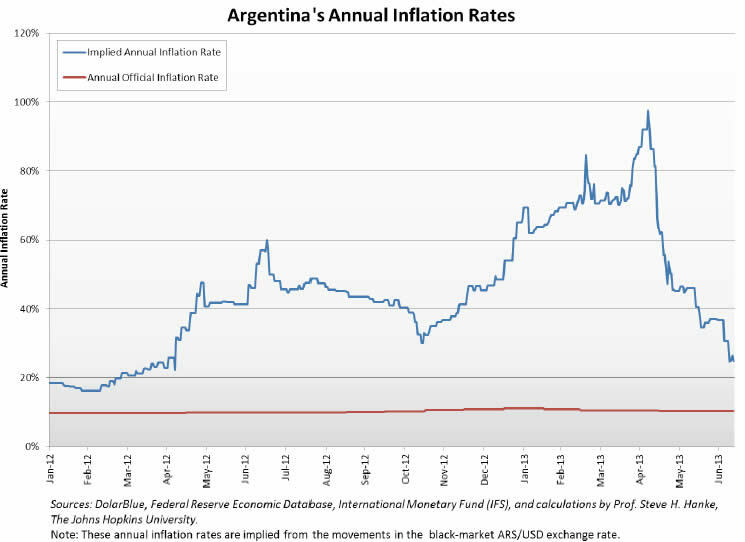 Argentina is once again wrestling with its long-time enemy, inflation. Now, it appears history may soon repeat itself, as Argentina teeters on the verge of another currency crisis. 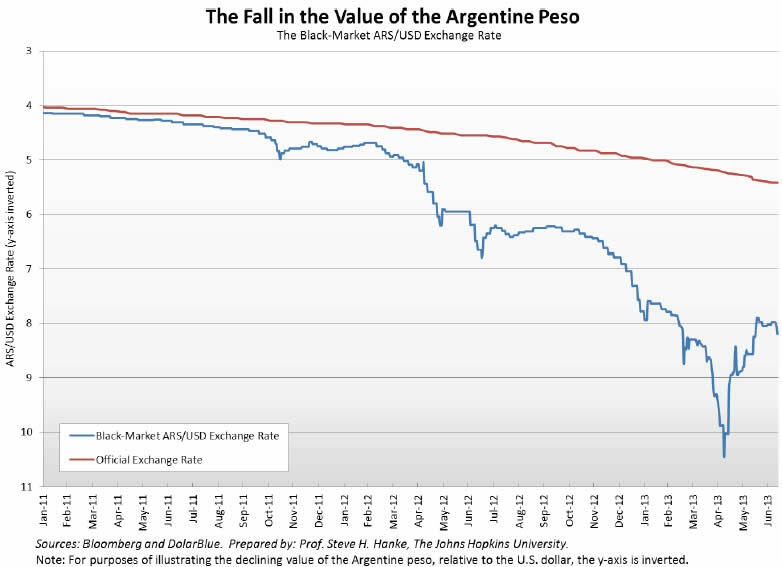 Capital controls and a deteriorating current account balance — coupled with a number of anti-business policies — have put the squeeze on the Argentine peso (see the accompanying chart). Currently, the peso’s black-market U.S. dollar exchange rate sits at 8.2 pesos per dollar, putting the peso’s value 34% below the official exchange rate. This yields an implied annual inflation rate of 24.8% (see the accompanying chart). For now, the effects of this elevated inflation rate have been officially hidden by Argentina’s massive price control regime. But these price controls are not sustainable in the long term. Indeed, these short-term "lying prices" only distort economic reality, ultimately leading to scarcity. 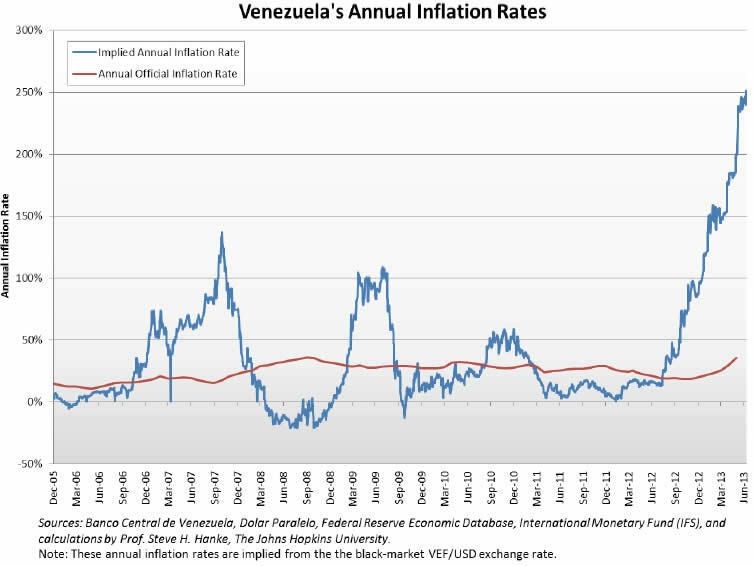 Venezuela has also relied on price controls in an attempt to suppress its inflation problems, with the same miserable results. Despite the country’s oil wealth, the massive Chavez-era social spending program continues to eat into the government’s primary balance, as well as dollar denominated revenues of the state oil company, PDVSA. 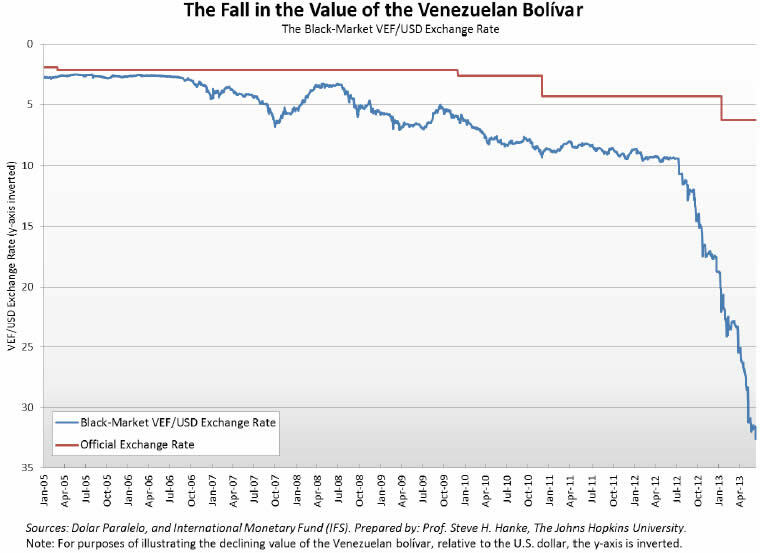 To fill this void, Venezuela’s central bank has been running the money pumps at full steam, eroding the value of the country’s currency, the bolivar (see the accompanying chart). This has brought about an inflation surge — in a country which was already no stranger to high inflation. Currently, the bolivar’s black-market U.S. dollar exchange rate sits at 34.42 bolivars per dollar, putting the bolivar’s value 80.6% below the official exchange rate. This yields an implied annual inflation rate of 249.3% (see the accompanying chart). Under the direction of President Morsi and the Muslim Brotherhood, economic conditions in Egypt have gone from bad to worse. Price and capital controls have caused shortages and a substantial slide in the value of the Egyptian pound. In consequence, Egyptians have watched inflation destroy their standard of living. Additionally, controls have delivered shortages of foreign exchange and many goods, like gasoline. In the face of the Brotherhood’s wrongheaded economic policies, official inflation and price statistics took leave of reality, and the black market quickly became a source of material support that the Muslim Brotherhood’s government could not provide. Yes, as the accompanying charts illustrate, the story of a failing Egyptian economy is one of a troubled Egyptian pound — and of the inflation troubles that accompanied it. 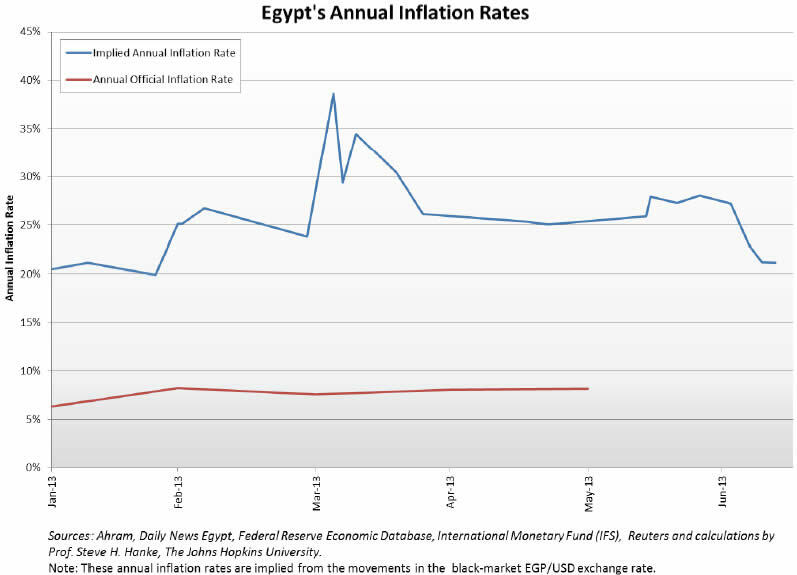 Indeed, as of July 1, 2013 (shortly before Morsi’s ouster), Egypt’s implied annual inflation rate was 27.1%. That’s over three times higher than the last reported official annual inflation rate (see the accompanying charts). Finally, we turn to Syria, where civil war and economic sanctions have shattered the country’s economy. In an attempt to beat Western sanctions and halt the fall in the Syrian pound, the Assad regime — with the help of Iran, Russia, and China — has begun conducting all of its business in rials, rubles, and renminbi. This decision supplements other existing arrangements between Syria and its allies that are keeping the Syrian economy on life-support. These include transfers of $500 million per month in oil and an unlimited credit line with Tehran for food and oil-product imports. According to Kadri Jamil, Syria’s prime minister for the economy, this life support is necessary because Syria’s devastated economy is the target of an elaborate plot, hatched by the U.S. and Britain, to "sink the Syrian pound." In a desperate, wrongheaded attempt to save its troubled currency, the Assad regime has imposed harsh penalties for currency trading on the black-market. This strategy proved wildly unsuccessful when it was utilized by Iran in October of 2012. Indeed, as was the case in Iran, attempts to suppress currency exchange have sparked a panic — a run on the Syrian pound. 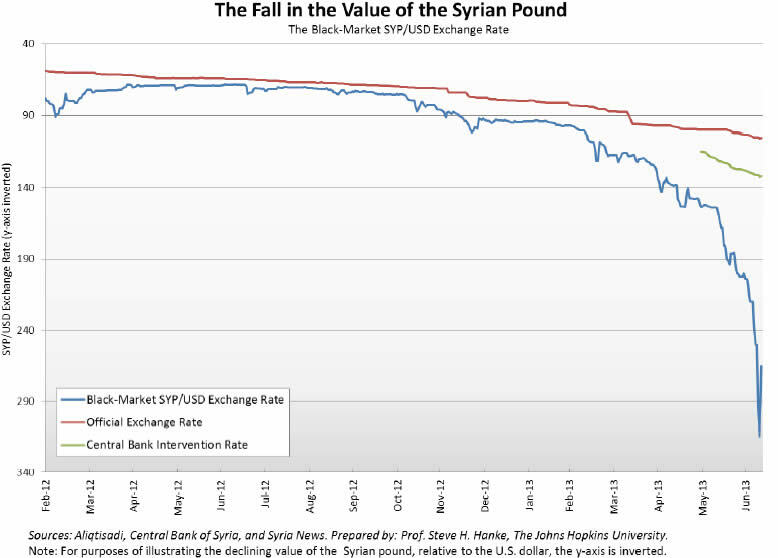 As of 10 July 2013, the value of the Syrian pound on the black market has hit an all time low, with the current black-market exchange rate now sitting at 265 SYP/USD (see the accompanying chart). 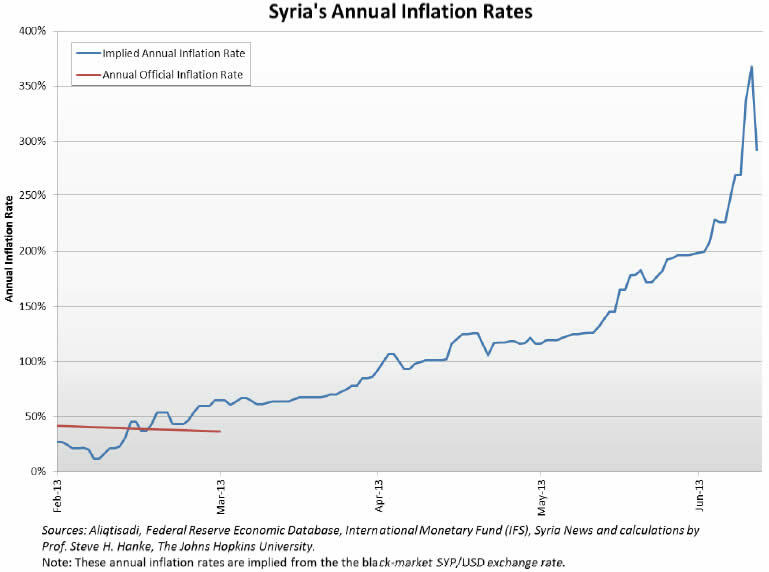 To fill that void, I employ standard techniques to estimate Syrian’s current inflation — an implied annual inflation rate of 291.1% (see the accompanying chart). Accordingly, Syria is now experiencing a monthly inflation rate of 68.0%. This means that Syria has exceeded the threshold for hyperinflation (an inflation rate of 50% per month). Only time will tell if this run on the Syrian pound will continue. But, for the time being, we can be sure that the Syrian pound will remain a troubled currency. A casual glance at the front page of any reputable newspaper will tell you that the current set of countries with troubled currencies are those that comprise many of the main "hot spots" of international conflict. Indeed, currency problems can often be a good leading indicator of other problems with a regime. For anyone involved in or monitoring international conflicts, reliable economic intelligence is absolutely essential. The data and charts contained in this column are now available on the Troubled Currencies Project page. The page also contains the following table, which I will update regularly with the latest black-market exchange-rate and implied-inflation-rate data. This article appeared in the August 2013 issue of Globe Asia.